I write to share with you my excitement over a forthcoming landmark event in the life of the Anglican Church of Southern Africa. In just over six weeks' time, representatives from all 28 dioceses, including experts in strategic planning, will hold two meetings, back-to-back, in which the Province will seize a Kairos moment to review our Vision and Mission as a church, to strategise around ways to implement our priorities, and then to make practical decisions on how to implement them in a manner that is productive, holistic and transformative. 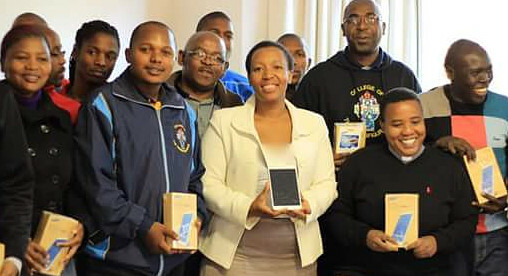 The Anglican Church of Southern Africa’s e-reader project has donated tablet computers to the Province's residential seminary, the College of the Transfiguration. This followed meetings with the Rector of the college, the Revd Dr Vicentia Kgabe, on incorporating and exploring new methods of teaching and learning through technology. The tablets will remain the property of the college and the project will be evaluated in October, shortly before the students commence their final exams. PHOTO: The tablets were handed to second-year students and academic staff by Mrs Lungi Makgoba (centre).